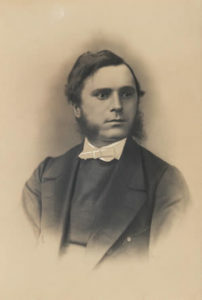 Coe was Minister of the Unitarian Great Meeting chapel in Bond Street, President of the Lit and Phil in 1862-63, and the author of a number of significant works. Born in King’s Lynn, Coe was educated at Manchester College, Oxford, the ‘dissenting academy’, that prided itself on religious independence. At Leicester’s Great Meeting, Coe’s Unitarian congregation wielded a strong Radical influence on the political affairs of the town and included several members of The Club. In the 1860s the chapel had 700 sittings, a day school with about 700 children, and a circulating library containing 600 volumes. By the end of the nineteenth century many of the prominent Great Meeting members had gone over to the Church of England, but their Radical and Liberal views continued to influence the town’s cultural and political life. The Great Meeting was known as ‘the Mayor’s Nest’, because so many mayors in the reformed Corporation came from its congregation. In 1874 Reverend Coe moved away to minister at Bank Street Chapel, Bolton, where he wrote many anti-Darwinian essays, culminating after fifteen years work in his 591-page volume, Nature versus Natural Selection: an essay on Organic Evolution (1895). Eloquent and intelligent, Coe was firmly pro-evolution, but challenged Darwin’s advocacy of natural selection as the driving force of evolution, writing that ‘Natural Selection cannot select. Still less can it create’.